Our bitumen equipment has a reputation for being among the most reliable and hardest working in the country. It's not uncommon for Penny Sprayers to go for 20 years without a refit. Penny's also service, recondition and upgrade any existing bitumen sprayer. Each Penny Sprayer is custom-built to individual customer requirements, ranging from 2,000L to 12,000L capacity. Penny Sprayers are constructed by a team of skilled craftsmen based in Palmerston North using materials suitable for the robust nature of the bitumen industry. Penny Engineering also manufactures bulk bitumen trailers from single axle trailers to quad-axle semi-trailers. Due to Penny Engineering’s many years of experience manufacturing trailers, the construction methods used enables the trailers to have a relatively low tare weight to ensure the maximum payload is carried. All Penny Engineering bitumen sprayer and trailer products are designed and manufactured to meet the intent of Roading New Zealand 9904:2006 Code of Practice for the safe handling of bituminous materials used in roading. 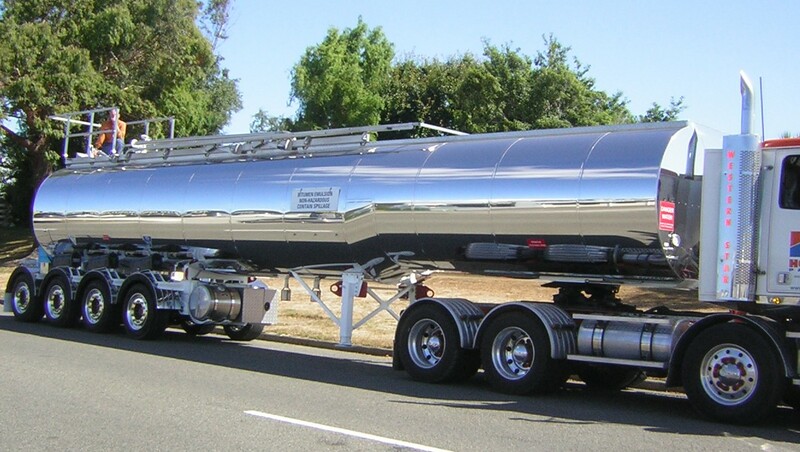 Penny Engineering's new baby - a sparkling new 34,000 litre bitumen SAF quad axle semi trailer tanker! The tanker's features include a diesel burner heater which can be run from a generator and an overhead delivery pipe for transferring product to an adjacent tank. The trailer with a two stage handrail on top of the walkway is a new development designed and built by Penny Engineering. The company’s Palmerston North engineering workshop welcomes equipment from around New Zealand and assists with mechanical, pneumatic, hydraulic, and electrical repairs in the field to help get sprayers back to work promptly. It upgrades and reconditions older sprayers with new technology and transfers existing bitumen sprayers onto brand new trucks. Spares of most consumable parts are stocked at the workshop and the skilled engineering staff at Penny Engineering manufacture parts not readily available.